Did some shooting today and somehow managed to recover 3 bullets. By some kind of a fluke I had the perfect size Hemlock log behind my target that these bullets just made it through and bounced off the logs in behind. We found them laying on the ground. Any of those will get the job done, Gerry. Good recovery on your part. 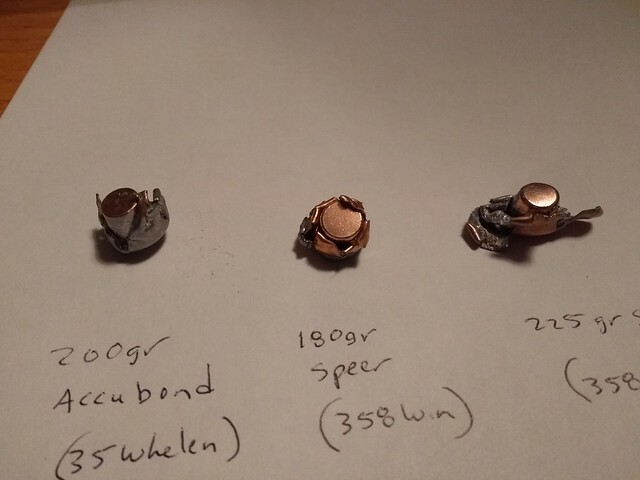 I have used the 225 grain Sierra in my 35 Whelen with good success. I never loaded it for a hunt with any of the 358s I've owned. No reason why it shouldn't work, however. What velocity are you getting with the 180gr Speer? DrMike, I would have no issues with the Sierra BT and even stuck one into a wounded bear that was stopped immediately. I would probably avoid a shoulder bone on a moose but other than that I would still hunt them with the Sierra's. Gil, should have been in the 2500-2600 fps range since I was at a higher charge weight so the impact velocity should be around 2100-2200 fps. I really want to find a great load with them and then see what they do on game. Considering it's excellent reputation I expect great things from them on deer and bear. Velocities around 2600 fps from the muzzle hitting deer under 100 yards was impressive, IMO. I shot four before selling the rifle and my buddy has over 20 now with his. Broadside ribcage shots gave either 10-20 yard staggers or "bang flop". Two of mine hit the ground so fast I didn't know where they went. Both were laying on their bellies. Didn't even roll on their side. Oddly (maybe) the one that ran the furthest (25 ish yards) was a quartering to buck that blew the snot out of the right shoulder and the bullet ended up just under the skin on the left ham. Perfect mushroom even after leaving a fist hole entrance through the shoulder (last time I tried THAT). 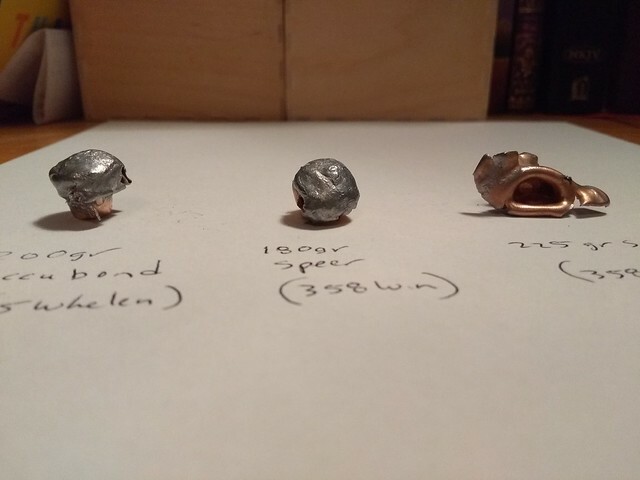 Buddy has used both the 220 grain and the 180. The 220s give a little more movement after the hit but not much. Maybe 40 yards tops without CNS hits. CNS hits we found with the Speer flat point was just too destructible for us ol' meat lovers.......but things happen. 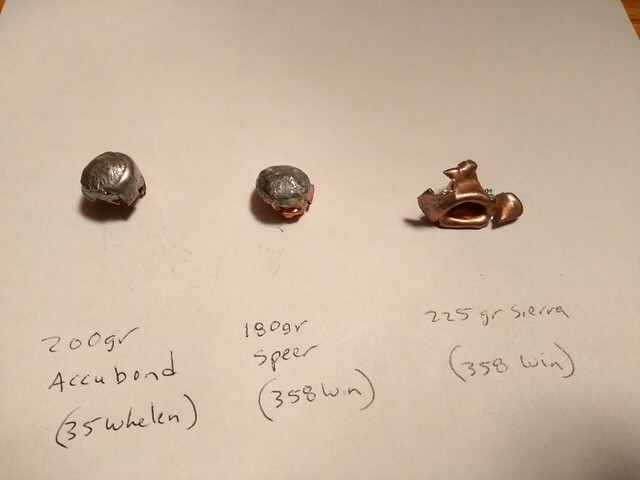 I'd have a 358 Win in a bolt gun now if they weren't so far out of my price range and the 180 Speer FN would be all I'd be shooting. Never got to shoot one out a ways but I wouldn't be afraid to on a broadside shot. Those Hot Cor bullets are one heck of a bargain IMHO. I ever get my wildcat project rifles done they will be one of the first I test. Will be attempting to work up a load for my 356 Win with the 220 grain Speer FN. Killed Texas pigs with it. Complete penetration lengthwise.